The NRC was informed by FirstEnergy on October 10 that it had identified what looked like a crack in the concrete shield building of the Davis-Besse nuclear power plant in Oak Harbor, Ohio. 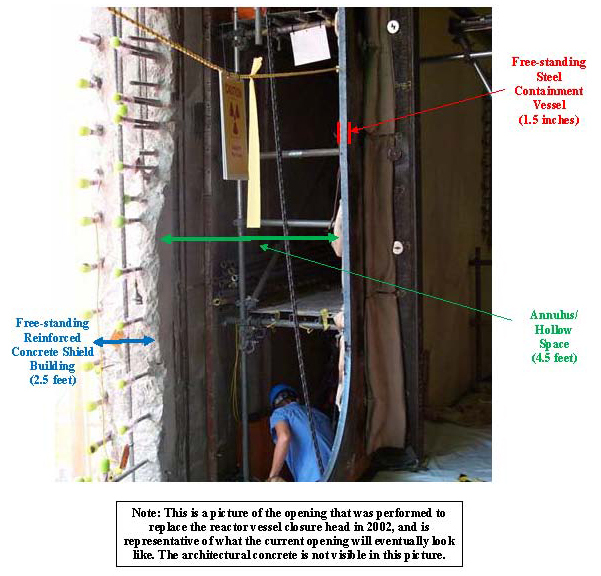 The plant had been shut down and workers were starting to cut a hole in the side of the building in order to move and replace the reactor head when they found the crack. The shield building is made of about three feet of concrete reinforced with two to three-inch steel rods. It’s important to emphasize that the shield building at Davis-Besse is not the reactor containment vessel. That vessel is made of one-inch thick welded steel and sits inside of the shield building separated by about four and a half feet of hollow space. The shield building’s primary function is to protect the containment building against external hazards. The steel vessel is designed to keep the radiation inside the reactor from reaching the environment. Because the plant is currently shut down there is no threat to public health and safety. Furthermore, this issue did not meet the NRC’s reporting requirements because it did not constitute an immediate safety concern. Nevertheless, the NRC immediately sent a concrete material expert to the plant. In addition, there were already two resident inspectors and specialists from the Region III office in Lisle, Ill., on the site monitoring the reactor head replacement activities. They are now also conducting an independent assessment of this new issue and are reviewing the utility’s efforts to understand the issue and any potential safety significance. If there are any challenges identified with the design function of the shield building the NRC will expect the utility to resolve them before restarting. Comparisons have been made between the cracks found at Davis-Besse and cracks in the containment structure at the Crystal River nuclear plant in Florida. However, there are significant differences between the two plants. Crystal River’s containment vessel is attached to the shield building serving as a single structure to prevent radiation from reaching the environment whereas at Davis-Besse, the free-standing steel containment vessel, which is separate from the shield building, serves that function. Because of this difference, the cracks identified in the containment structure at Crystal River in 2009 challenge its safety and that is why the plant is currently shut down. Security is the number 1 most important thing. They need to find a way to cover the crack for the safety of the nuclear power plants. I’d have to agree to an extent- the designers and builders do a great job in protecting our extremely important nuclear facilities. However, they’re still vulnerable to the oft-reported poor security practices and procedures. I’m happy to see we are proactive in this country to make sure our important nuclear plants are safe.